In the hustle and bustle of these past couple weeks, I didn’t want to forget to mention a technological breakthrough that occurred Friday in Bremerton Municipal Court. A witness took the virtual stand. To elaborate, Hsushi Yeh, a Tacoma-based ophthalmologist, was called to the stand to testify to the vision of Mark Lewis. Lewis, a prominent local jazz musician, was convicted of obstructing police Monday, in a trial where his vision was scrutinized. Yeh couldn’t make it to Bremerton, so Judge James Docter authorized his testimony via Skype. It was a first for the new Bremerton courthouse opened last September. Could this be a sign of things to come? I’m thinking about the money that could potentially be saved in instances where a witness wouldn’t have to travel sometimes great distances to testify in court. In Port Orchard, Kitsap County’s district court is already using video appearances from jail so officials don’t have to transport inmates handcuffed together into court. Kitsap County District Court Administrator Maury Baker said that there are “intense conversations,” amongst the judges about bringing in the capacity to let witnesses testify from afar. He believes the technology would have great benefits and could start in less serious legal arenas, like traffic court. For instance, what if someone from out of state got a ticket here and wanted to fight it — without having to fly back out here? From there, it could be expanded, likely as long as attorneys on both sides of a case agree to it. “It’s a brave new world,” he said. Kitsap County Superior Court Administrator Frank Maiocco said at present, the county’s highest court doesn’t have the technology — a TV with an internet connection — that would make Skyping a witness possible. But he acknowledges that courtrooms in the future could be equipped to make it possible. Assuming, though, that the judicial powers-that-be are ready for it, he added. THE CASE BACKGROUND: Well-known Bremerton jazz musician Mark Lewis is fighting charges of disorderly conduct and resisting arrest after an incident in September on Kitsap Way. Accounts of the incident offered by Lewis and by the officers who arrested him vary greatly. Police contend the 52-year-old, who performs each Saturday at El Coral Mexican Restaurant on Fourth Street, was acting aggressively and had punched a sign at a fast-food restaurant before grabbing onto an officer’s gun during a tussle. Lewis, a Key Peninsula native who is legally blind, said he was disoriented and had no idea why he was being handcuffed and arrested. THE CASE BACKGROUND: Jane Roe (not her real name) was fired from TeleTech in East Bremerton in 2007 because she failed a drug test. However, she was legally using marijuana as medicine under state law to treat migraine headaches. She sued after losing her job. The case was thrown out of Kitsap County Superior Court. It was appealed by Roe’s attorneys to the court of appeals, who ruled that the state’s medical marijuana act does not protect patients in employment situations. This morning, the state’s supreme court will hear from attorneys on both sides and debate this issue: does the state’s medical marijuana law provide any protection to legal medical marijuana patients in the workplace? We’ll cover it live beginning at 10:30 a.m.
I’ve also posted the video here, via TVW, of the arguments so you can also hear them for yourself. As it turns out, Kitsap isn’t the only county that’s put its lawyers to work in traffic court. King County too, has just begun a similar program, according to the Seattle Times. Kitsap Prosecutor Russ Hauge argued last fall to the county commissioners that many people are able to weasel out of tickets if they know the right thing to say to the judge. Before this week, no lawyer was in court to present the police side and defend motions seeking to dismiss the ticket. Hauge also argued that it would result in a revenue uptick for the county, somewhere in the neighborhood of $148,000. I sat through the first day of traffic court Monday, where Claire Bradley stood in for the state. Bradley is the chief deputy prosecutor for the office’s district and municipal court divisions. I was surprised, as some readers were, that nearly all the ticket’s contestants were not present in court and that they had lawyers present on their behalf. Wouldn’t the cost of a lawyer nullify the savings of getting a ticket dismissed? 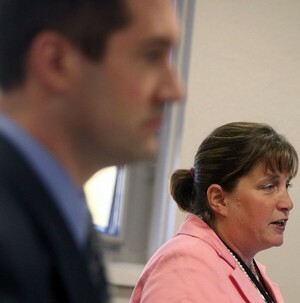 Not necessarily so, said Ryan Witt, a Bremerton defense attorney I talked to during the proceedings. Insurance rates can go up for drivers who pony up and have tickets on their records, he said. Those costs can make the lawyer worthwhile. Something else I’d meant to mention in the article is the reverberating effect having a prosecutor in court could have. While the court calendars may just get longer with an advocate on both sides, less tickets may be contested. Why? Simple: should a contestant call a lawyer for help, that lawyer might now advise the contestant that fighting it isn’t a good idea with the state in the room. Without a prosecutor, that same lawyer would have had a much easier time getting it dismissed. There is also the possibility of plea negotiations to speed the calendar along. For instance, the last lawyer Monday had three clients. In each case, he and Bradley worked through the infractions as written, finding some common ground and disputed parts. But they both came to consensus, thus negating the need for a judge to make a decision, and moving things along more quickly.